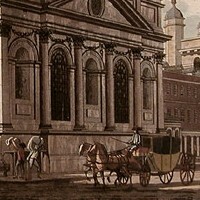 Irish Architectural Draughtsman, Printmaker, 18th Century, Biography and Paintings. The engraver, watercolourist and draughtsman James Malton is best known for his 'Picturesque and Descriptive View of the City of Dublin' - an outstanding series of 25 aquatint engravings initially published between 1792 and 1799. Believed to have been born in London around 1760, he was the son of the architectural draughtsman Thomas Malton (1726-1801), and moved with his father to Dublin in 1785, where he worked as a draughtsman for the famous architect James Gandon who designed the Customs House (1781-91), the Four Courts (1786-95) and the King's Inns (1795-1815). His tenure with Gandon was not a happy one, and Malton duly left to pursue his art. In 1790 he exhibited two topographical landscapes at the Society of Artists in London, while at the same time working on his Dublin views. For each view, he produced a large-scale watercolour painting, followed by a drawing which was then printed using the etching and aquatint method which gives the work the look of a watercolour. Publication began in 1792 and continued until 1799. The views comprised: (1) Great Courtyard, Dublin Castle ; (2) Customs House ; (3) Royal Exchange ; (4) Leinster House ; (5) Trinity College ; (6) St Patrick's Cathedral ; (7) Tholsel ; (8) Charlemont House ; (9) College Library ; (10) Barracks ; (11) The Parliament House ; (12) West Front of St Patrick's Cathedral ; (13) Provost's House ; (14) Old Soldiers Hospital, Kilmainham ; (15) Royal Infirmary, St Phoenix Park ; (16) Powerscourt House ; (17) Lying-In Hospital; (18) Rotunda and New Rooms ; (19) Marine School, Dublin, Looking up the Liffey ; (20) St Stephen's Green ; (21) View of Dublin from the Magazine, Phoenix Park ; (22) View from Capel Street, Looking over the Bridge ; (23) St Catherine's Church, Thomas Street ; (24) Blue-Coat Hospital ; (25) View of the Law Courts, Looking up the Liffey . An outstanding printmaker, Malton's views are the finest and most important series of engravings of Dublin, depicting most of the principal buildings along with groups of figures and scenes of daily life, and constitute a valuable pictorial record of the capital at the turn of the century. During the period 1792-1799 Malton also exhibited his drawings and watercolours at the Royal Academy in London, where he eventually settled in 1798. His father died in Dublin in 1801, and James outlived him by a mere two years, dying of brain fever in Marylebone. Today, he is regarded as one of the major Irish artists of the eighteenth century. He was survived by his elder brother, Thomas Malton junior, also an architectural artist, who died in London one year later.  For the evolution of Irish fine arts, see History of Irish Art.